Broadcom's follow-on act to the trident+ switch integrated circuit is the shiny new StrataXGS Trident II BCM56850. It was announced in 2012, but became available in production volumes in November 2013. Broadcom does not share detailed information about their products except under nondisclosure. But you can guess that -- if a new switch was introduced in November or December of 2013 and it has lots of 40 Gb/s ports, well -- it walks like a duck. We believe that Broadcom has wins from switch manufacturers Arista, Cisco and Extreme Networks -- that have been spotted so far. In common with the trident+, all the packet buffers are on the switch chip. Where the Trident+ has 9 MBytes of packet buffers, the Trident II has 12 Mbytes. The memory is segmented into dedicated per-port buffers and a dynamic shared pool that can be loaned to any queue and port that needs it. Most of the memory is in the shared pool. For more information, see the listing for the Arista 7050X. While we have not seen switches implemented with more than a single Trident+ chip, the Trident II can be used in larger switches with crossbar connections between switching elements. The Arista 7250 is an example. Broadcom produced a generic OCP submission for the Trident2 ASIC in 2013. The 56850 has 128 SERDES to provision 32 quad ports. If this was used for 1RU switches with 10 Gb/s ports, 48 SERDES would be stranded in the box with no place to connect. That seems like it would be sufficient reason to have the 56854 varient. The trident was followed by the trident+. Thus it is with the trident-II. Details in the press release. The new chip is made with 28 nM features which is a step smaller than the 40 nM geometries in its predecessor. VxLAN performance is also much better. The II+ can support eight 100 Gb/s ports. It is built with 10 Gb/s SERDES and so requires an external gearbox IC to step up to 25 Gb/s lanes. P/N for gearbox BCM82792. Mellanox commissioned (paid) Tolly to do comparison tests against an Arista switch representing the universe of Trident-II products. 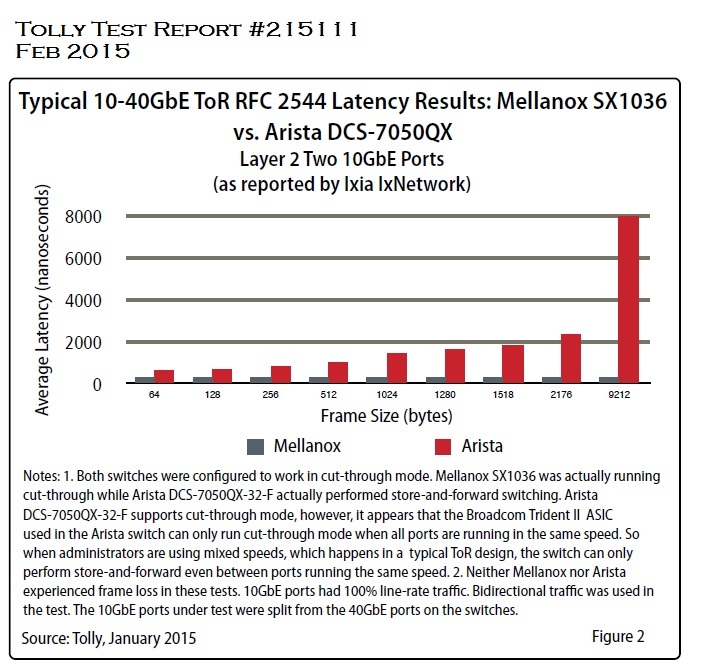 Tolly was able to show that the Mellanox SX was better than the Broadcom Trident-II when the packet rate is really high. That happens when there are lots of small frames. The Tolly report is #215111. Pure speculation: Because Mellanox dedicates memory to each output port, each buffer chunk will be fed out at a known speed and cut-through rules can be followed. Because Trident shares memory, any buffer chunck might be headed for any port, so changing the mode of the switch when speed matching happens anywhere might be the best solution. The RFC2544 test seems carefully constructed to assure that buffers aren't stressed.